Governor Sol Matugas has ordered tighter security in the premises of the provincial capitol compound after a failed attempt to assassinate her shortly after the 8 a.m. flag-raising ceremony, Monday, Aug. 13, at the capitol grounds in front of the Hall of Justice, Surigao City. 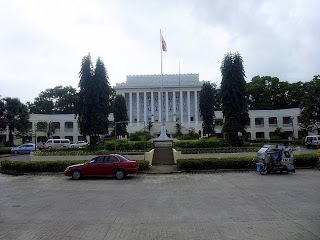 It was learned that the governor sought refuge from the rain at the entrance of the Hall of Justice building on her way to the Provincial Convention Center where she was about to give her regular Monday morning sharing message with capitol employees when the suspect, Samuel Lapac, Sr., a former barangay official, attacked her using .45 caliber pistol but her close-in security personnel shielded her. Police Senior Inspector Diomedes Cuadra, deputy chief of police of Surigao City Police Office, identified the injured security escorts as PO2 Jerson Guindulman, 35, who was hit on his right leg; PO2 Ronnie Goles, 34, who was hit on his chest, right upper arm and left side of his neck; and Remar Aguilar Quinones, security guard at the Hall of Justice, who sustained gunshot wound on the back of his right shoulder. Goles was airlifted to Cebu City on Monday for emergency treatment while Guindulman and Quinones were admitted at the Surigao Medical Center and are in stable condition. After recovering from shock, Matugas admitted there was laxity in security in the capitol premises. “There was slackness in security, I think there is now a need for me to have my own security personnel which I can trust,” said Matugas. The governor also said they will tighten security to those coming to her office, and new measures have been taken to prevent similar incident. Meanwhile, the gun man insisted he acted alone and that the gunshots were not meant for the governor. “It’s not for her, I don’t have personal grudges against her. Her husband, Congressman Francisco Matugas, and I are friends,” Lapac said. Lapac refused to give further details about the incident. 1st district representative Francisco Matugas, the governor’s spouse, said the President has already directed the Philippine National Police (PNP) to conduct a thorough investigation on the incident. “Likewise, the president also directed the PNP and the Armed Forces of the Philippines to provide additional security to Governor Sol,” he said. Rep. Matugas said he did not discount the possibility of politics as the motive of the slay try.